PAKWACH – At least fourteen people have been confirmed dead and others critically injured in a car accident in Pakwach district. An eyewitness says so far 14 bodies, including 12 women have been counted. He says the vehicle was carrying fish mongers mostly from Aliwara, the neighboring Democratic Republic of Congo to Panyimur Market. 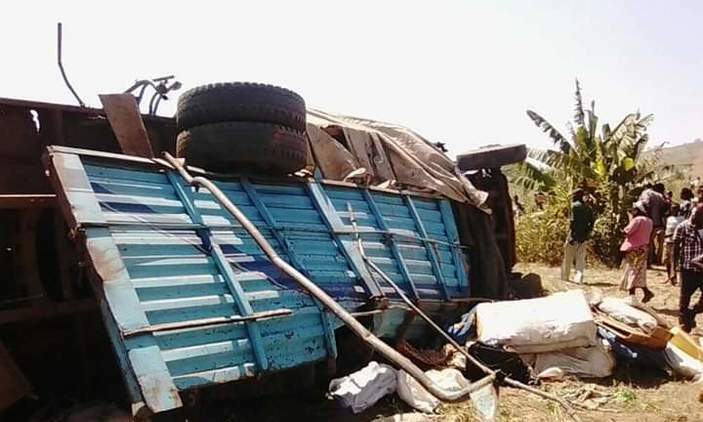 An eye witness said the victims met their fate after the Fuso truck registration number UAV 118S, they were traveling in lost control and veered off the road before it overturned several times falling into the valley. Got Malara is a notorious blackspot that has seen many fatal accidents. Josephine Angucia, the West Nile police spokesperson confirmed the incident. “It’s very unfortunate we 14 lost people mostly women dealing in the fish trade,” She said expressing fear that the death toll is likely to rise, as those injured are in critical condition. Survivors have been rushed Panyimur Health Center III and Angal hospital for treatment.